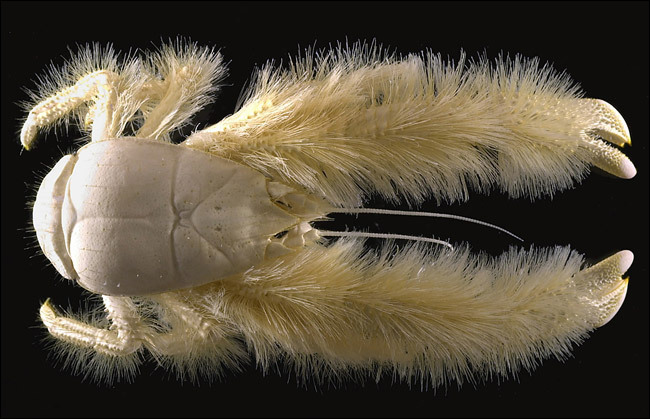 Just the name of this new crab species found in the depths of the Antarctic spoke to me, because if you combine the word Yeti with anything it’s bound to be super rad. But then I saw an actual picture of this new crab species just found and I was even more blown away! I mean, how awesome is this creature?! Pretty amazing too that these things were just recently discovered hanging around deep ocean vents that are shooting water out that up to 721 degrees Farenheit!!! I guess we really don’t need to look for aliens in outer space anymore because we’ve got them right here on earth. I wonder how many other strange creatures exist that we’ve yet to discover right here? I wonder what lurks beneath the earths crust-surely there are some amazing creatures down below even further-who know maybe an intellegent race? But in the meantime I am just happy that there’s now something on this planet called a Yeti Crab! !